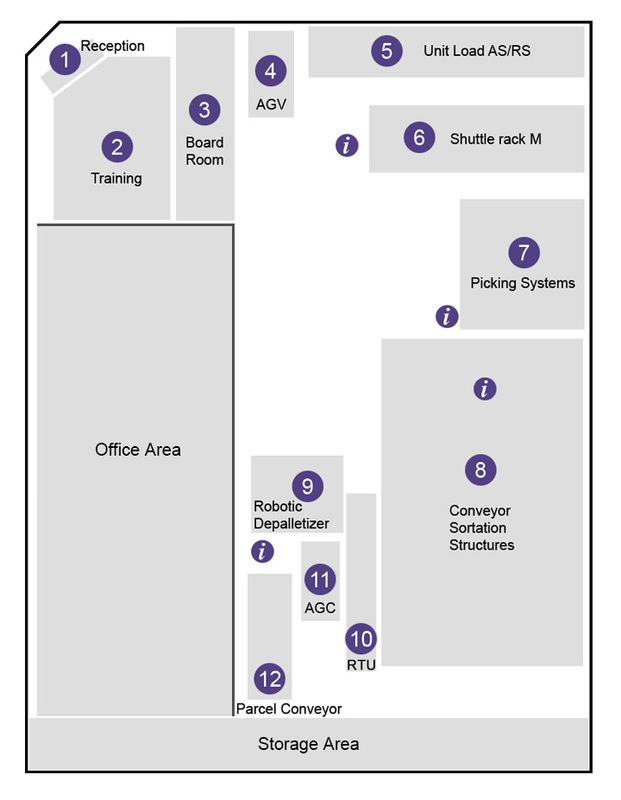 The Innovation Center, based in Bolingbrook, Illinois, features the advanced technology solutions of Daifuku, the world’s leading provider of material handling systems. In addition, the facility is wheelchair accessible, part of our effort towards the realization of a universal design. Whether you are visiting for a tour or for comprehensive training, you will be greeted with a smile by one of our staff. Our modern multi-media training center offers a traditional classroom setting with hands-on training on our material handling technologies just steps away. The center facilitates everything from our Advanced Technology Training class specifically geared for our Integrator Partners to our internal continued education programs. The Board Room is a 30 person executive style meeting room complete with a full service kitchenette. It overlooks the material handling technologies on display in the Innovation Center. Applicable to almost any industry, Daifuku's extensive selection of standard and customized AGVs offer loading and unloading functions for a variety of loads from light to heavy, including steel plates, paper rolls and aluminum coils. Capable of operating using every type of guidance, our wide selection enables us to provide you with the most cost-effective and efficient solution that work around-the-clock to meets your needs. Automated Storage and Retrieval Systems are available in various unit load models. ASRS is effective in factories, distribution centers and disribution storage systems in refrigerated, frozen or room temperatures. Experience inventory control operation by integrating Daifuku's Automated Warehouse Controller into your unit load system operations. In the distribution industry, the need for ASRS with sorting and sequencing functions is increasing; Daifuku's ASRS meets these needs while saving labor, energy and footprint. There are numerous ways to pick depending on pruduct type and picking frequency. During the tour, you will see a variety of picking technologies that can be implemented to improve efficiency and reduce the time and cost associated with your fulfillment process. A closed integrated loop showcases each of the conveyor and sortation technologies. The Innovation Center is also used to perform proof of concept tests with actual product loads from clients as well as internal R&D purposes. Several of our custom metal fabrication items such as mezzanines, conveyor support structures, and safety railings are on display in the Innovation Center. We also provide catwalks, safety ladders, stairs and stair towers, and other custom fabricated structures. Robotic depallitization products are designed to eliminate injuries, reduce product damage and increase rates. We offer full line design and simulation services that utilize the most modern technology and equipment. These systems reduce costs, and deliver exceptional reliability and uptime. Scheduled for installation in the Innovation Center during 2018, Robotic Truck Unloader is a self-guided, autonomous robotic truck and shipping container unloader. It utilizes advanced perception technology that allows it to sense and acquire product that has been floor loaded within semi-truck trailers or ocean freight container. Along with AGVs, Daifuku provides cost-effective AGCs that offer the optimal flexibility for moving materials and parts around your facility. Daifuku's SmartCart® AGC is a customizable, flexible and cost-effective transport solution guided by magnetic tape, providing quick installation and modification of the guide path. SmartCart AGCs are ideal for moving products on an assembly line or transporting goods throughout a plant or warehouse. Because they're automatic and durable, SmartCarts provide reliable and consistent point-to-point movement of everything from small parts up to heavy pallets. Designed to meet rigorous FedEx specifications, Heavy Duty Parcel conveyor is rugged and dependable. Interactive kiosks provide visitors with the opportunity to learn more about product applications by viewing videos, rendered engineering drawings, and specification sheets for each of the technologies in the Innovation Center.